Marie Louise Elizabeth Vigee-Lebrun, a famous painter during the 1780s and 1790s, was the kind of person every painter dreams of becoming–even today. She was not only one of the most famous, highly-paid painters but also one of the first women accepted into one of the most prestigious art academies in the world. But Marie did not get to have everything. As a young child, her family did not have much money for luxuries. To make matters worse, her father, an unpopular portrait painter and hairdresser, had passed away when she was just 12-years-old. To support her family, Marie had to produce and sell many paintings. Just like many other famous painters, Marie was well known for her unique style. She created many beautiful paintings with a strong sense of composition. Everything in her portraits is carefully chosen–from the background, to the costuming and poses of her subjects. In her paintings, Marie’s favorite theme is to portray the innocence of children. 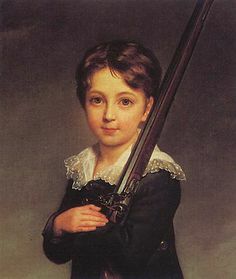 Her painting Portrait of a Young Boy, which she produced in 1817, is a popular example of this. At first glance, the feature that draws the viewer’s attention in this piece is the stunning pale face of a small child against a very dark background. A large gun propped calmly on the bone of his shoulder leads the viewer’s eyes up and down the canvas, thus highlighting his dark clothes and his big, bright eyes. This was one of Marie’s last paintings. During the last few years of her life, when the political situation in Versailles, France, worsened, Marie settled in Paris. The people of Paris stormed into the royal palace filled with hunger and anger because of the high amount of taxes they were forced to pay. They eventually captured and executed the queen of France and her family. Because of this dangerous situation, Marie ultimately had to escape to Italy with her daughter and the governess. She had a very close relationship with the queen, which made it even more dangerous to live in France. She finally got permission to go back to France in 1802. There, she only painted very few paintings because of her already successful reputation and ceiling-high income. Marie proves that women are capable of anything. During her life, she was one of the highest paid and most famous people in France, which says a lot considering the time period. Marie had also come from a low-income family, yet she still managed to achieve incredible feats. Marie Louise Elizabeth Vigee-Lebrun is truly the face of talent and determination.